12 months have passed since the widely discussed General Data Protection Regulation (GDPR) became enforceable on 25 May 2018. GDPR applies to all businesses anywhere in the world that handle, store or process the personal data of EU citizens. This breakfast seminar will reflect on the past year and discuss how GDPR compliance has effected businesses. The legal experts from Gardner Leader will be discussing the common pitfalls and how businesses should be plugging the gaps and creating a defendable position should they act in breach. 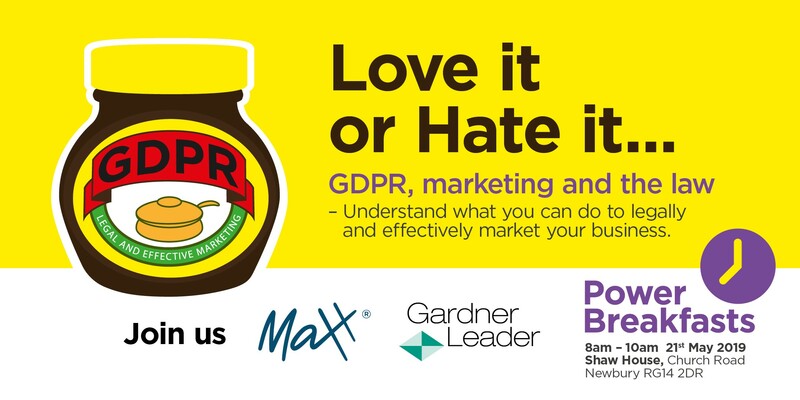 The marketing experts from MAXX will be addressing how to run successful marketing campaigns that deliver fantastic ROI whilst maintaining compliant with GDPR. There will also be a Q&A session after the presentations to discuss GDPR related issues with both legal and marketing experts where you can share your experiences with similar businesses in the region. Gardner Leader: Progressive, innovative and focussed on excellent client care, Gardner Leader offers the full range of legal support giving clients trust, value and peace of mind. Clients are individuals and businesses across and beyond Thames Valley ranging from first time buyers and start-ups to venture capital funds, charities and PLCs. MAXX: Multi award-winning communications agency working across the corporate sector, not-for-profit and education to help organisations raise their profile, increase brand awareness and build sales pipelines through excellence in design, online, marketing and video.